Paul Fussell died in 2012. Many obituaries have been written, all worth reading (The Guardian’s here and the New York Times’ here). I tend to read by subject. I’ll travel to France, say, and when I get home I’m reading Lunch in Paris, The Greater Journey and My Life in France. I get home from Turkey and suddenly I’ve got books about Turkey backing up on the Kindle app on my iPhone, Ataturk, Birds Without Wings, The Oracle of Stamboul, A Fez of the Heart. 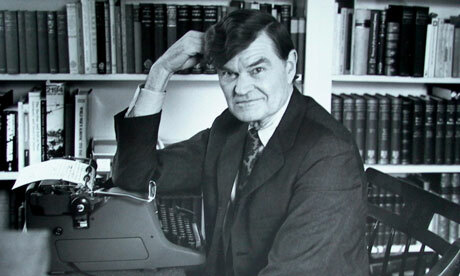 The US writer Paul Fussell’s 1975 book The Great War and Modern Memory was, according to the British military historian John Keegan, revolutionary. Fussell, in what he called “an elegaic commentary”, shaped a picture of the horrors of the first world war, and the cold stupidity of its leaders, made more trenchant by his own experiences in the second world war. He also used the writings of Robert Graves, Siegfried Sassoon and others to show how the romanticising of the war and its heroes provided the creative spark for modernism, and the sensibility of disillusion and distrust of authority that characterised the so-called “lost generation”. I’m a huge Barbara Tuchman fan, but I read Fussell before I read Tuchman, and Fussell colored my view of World War I so strongly that Tuchman’s WWI books are my least favorites. 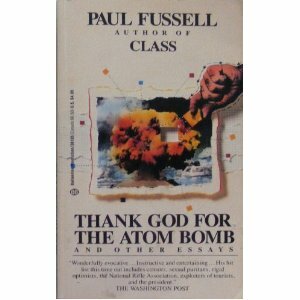 I remember particularly Fussell’s Thank God for the Atom Bomb. The title essay is the grunt’s eye view of the bombings of Hiroshima and Nagasaki. 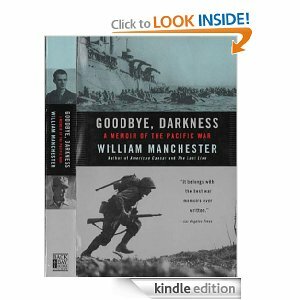 The title comes from a line from another book by another author, Goodbye, Darkness by William Manchester, another grunt’s eye view of the war in the Pacific. Sacrifice takes on a different meaning for you, when you’re the sacrifice. I had an abusive letter just yesterday that objected very much to my “lack of patriotism” and my willingness to traduce the United States. I don’t think I do that at all. I like the United States so much that I wish it would grow up. I’ve just bought Fussell’s book on WWi and will read it. But from the blurb on Amazon, it sounds as if his book complements Tuchman’s books, not supercedes them; it’s a different point of view (as I understand the summary). I think The Guns of August is one of the best books, overall, written on the beginnings of the war, anyway. As for stupidity of leaders? You REALLY want to read about that sort of thing? May I recommend US Civil War history, military history that is? Nothing quite like it to point out that war seems to be the grand opportunity for every moron with a negative IQ to take charge of human lives and waste them. Oh yes, and for a particular European country in WWI, may I recommend The White War by Mark Thompson. That’s the story of Italy’s participation in WWI. That book put me beyond rage into a Never-Never Land of numbness, I suppose. Competence among military leaders is about as frequent as in other fields, perhaps less so. The true tragedy of the US is the American people’s worship of the uniform, the glitter of brass, the bands, the flag waving–and we never, ever learn. Ever. It’s the deification of the warrior, Joyce. It’s across all societies. It’s a part of us, and, well, know your enemy. Frankly, Dana, I think it’s worse in the US (deification of the warrior as you put it so well) than, say, Canada or parts of Europe. That’s probably a much better reason to read military history than I have. I do it, I think, to drive home even more the lesson that war is utterly insane and almost always unnecessary. And a certain type of masochism. And that most military leaders are lame-brain idiots who couldn’t make it in any other profession. Unfortunately, i think I know my enemy all too well.